In the last few years, I’ve noticed writing styles have changed. They are now like our society. Life is mad dash from morning to night with little time in between. Less is more, publishing houses insist. Tighten, tighten, tighten. As writers, we are forced to adapt. But is this a good thing? As a reader, I’m not so sure. Perhaps it’s the countless books I’ve read, or had read to me, over the past sixty-nine years, but I struggle with these new guidelines. My latest peeve, the one that prompted me to write this post, was a book written by four of the most popular writers in Christian fiction. I was excited when I saw the book on Amazon and put it to the top of my reading list. The story had to rock. These authors are as popular as snowflakes in winter. But shortly into the story, my snowball burst. Except for the last section, written by an author who delighted me, it was one of the hardest to “keep reading” books I’ve ever read. In the first three sections I felt like I was dangling in that zone between sleep and awake. Nothing anchored me anything or anyone. I remember the characters only because they were the same as those in the final section. Which brings me to my pondering. Where does lean end and anorexic begin? The first section, that should have anchored me into the story, read like an outline. Whoever’s pov I was in felt like a pine box. Try as I would, I could not find a comfy spot to curl up in and let the story take me to some far and distant land. Instead, I was in a world that sped past me faster than my surroundings when I’m riding the tilt-a-whirl at a local fair. To be fair, some of the old classics can describe a flower in a field in so much detail, I’ve forgotten why I’m in the field by the time I see exactly what the author saw and felt. And who really cares if it’s a coffee or a tea stain on the white tablecloth, unless it’s a mystery you’re reading. But, fluff gives me an option. Over the years, I’ve become very good at skimming. But in this day and age, that’s not practical either. What I need is something in between. I want to know my protagonist, where she lives, what she likes, what she doesn’t, and what she wants bad enough to write a book about. I want a subtle description of her that allows me to fill in the blanks with my own imagination. I don’t want a block of white houses described, but if one is brown with a red horseshoe on the door, my interest is peaked. I understand how age and time can dictate writing styles, but for me, they have gone bi-polar. Older stories tweak my skimming abilities, while many newer ones leave me frustrated because I can’t find the link between the dots. When I find a story that flows like a river, ripple after ripple, around and over obstacles and finishes in a waterfall, my toes curl up in delight, right back to my heels. Every day, all around us, small insignificant events take place. Most go unnoticed, but others are life changing. God moments, I call them. My interpretation of be still and know that I am God. Ten years ago, my husband, Alex, was diagnosed with cancer and given five months to live. Shock waves shot through our family, neighborhood, and church. Alex shared his time and resources with everyone. He had a marvelous sense of humor that lightened even the heaviest situations. So many people wanted to say goodbye and spend time with him. The phone rang constantly. Our front entrance became a revolving door. Our daughter came home to help me with Alex’s care. One day, a month after his diagnosis, our daughter left for the day to spend time with her brother. By mid afternoon, several friends dropped by, and our daughter phoned, saying she was spending the night at her brother’s. Unusual, I thought, but realized siblings can comfort each other in a way no one else can. I pushed the unusual from my mind. I was exhausted, and deep shadows on Alex’s face bore witness to his weariness. With much effort, he pushed out of his recliner saying, I’m going to lie down. Please come with me. I glanced at all the dirty dishes in the kitchen, left behind by constant company, and opened my mouth to ask for fifteen minutes. But my words stopped. Since it was too painful for Alex to lie down, I collected pillows from the beds around the house and made our bed into a giant recliner. As we snuggled together, warmth flowed through us, much like an electric blanket on a cold winter night, and nothing around us existed. Alex’s pain ebbed. We talked about the fun things we’d done, the places we’d been, the people we’d met, the mistakes we’d made. We laughed about the shenanigans our children had done. The wonderful adults they’d grown to be. Evening turned into night. Still we talked and laughed. With no warning Alex’s mind softened and he returned to Bosnia, where he’d served as a military engineer years ago. I held him until he calmed, then we drifted off to sleep. The following day, Alex’s pain returned and he was admitted to the hospital. Within hours he was gone, but stories pierced my darkness. The night before, Alex’s cousins were coming from Edmonton to visit him, but a tire on their car went flat. By the time AMA changed it, it was too late. Friends were coming from Calgary, but a sudden blizzard closed the highway between Calgary and Red Deer. And our daughter chose to spend the night at our son’s home. Wonderment filled me. God used blizzards and flat tires and sibling love to give Alex and I that last evening by ourselves, to lie down in green pastures. Even now, ten years later, when I find myself in darkness and see no way out, I remember that night and am filled with hope for tomorrow. This morning I awoke to a Neuralgia flare-up, a neurological condition that has taken up residence in my brain for many years. My head throbbed, feeling like a giant pimple not quite ready to be popped, but regardless, something or someone was squeezing it. Waking up in this state is not new or surprising, but what makes today is a trifle different is, I must write a blog post on thankfulness. As I stared at my screen trying to gather my thoughts the letters and icons across the top turned into bright stars doing a square dance all over the page. My eyes drifted closed and I leaned back in my chair. Within seconds a beautiful old hymn floated into my thoughts—I see the stars—I hear the rolling thunder—Thy power throughout the universe displayed. Immediately I was reminded of how small and insignificant I am, yet my Heavenly Father took time to nudge me into refocusing my mind. Gratitude overflowed from within and I recalled a few of the many blessed moments in my life. It overwhelms me knowing that our great and mighty God gave me the privilege of growing up in a home where godliness was a way of life. Sunday School was not an option, and I am thankful for those Sunday afternoons because it was in that small group I committed my life to Christ. I am grateful for my children and grandchildren, my brothers and sister, my church family and my writing family. I am thankful I live in a country where freedom is a reality. It may be cold at times, but I have a warm house and my cupboards and fridge are always full. When I’m lonely, friends or entertainment are only a click away. My eyes don’t work very good anymore, but I have an active imagination that can fill in details I can not see. It would be nice to say that throughout my mini praise the pain in my head lessened but that is not so. It hurts big time but it no longer controls my feelings. For this I’m grateful because by changing the direction of my thoughts I was able to complete this post. I am also grateful for my soft comfy bed I’m about to curl up in until my head returns to normal. While I’m being thankful for big things, I’m reminded of the small day to day blessings I find myself taking for granted. For example, my four kitties, Beebins, Oliver, Athena, and Bentlee who will curl up around me, their soft purrs and unconditional love always bringing me comfort. Satisfied I’d done all I could for this post, I clicked on the save icon and that beautiful old hymn once again filled my thoughts. Then sings my soul—My Savior God to Thee—how great Thou art. Coming out of Egypt is a story of survival that grips your attention from beginning to end. Sixteen year-old Marva wacked her father’s head to stop him from sexually assaulting her younger sister, but it did more than stop him. It killed him. Terrified, the girls dump him in the ocean. Being alone in the world, except for an elderly aunt, the girls struggle to exist. Marva takes a job as a mechanic helper and faces ridicule everyday. She enrolls June into another school and life begin to feel normal. A former teacher, Cicely, enters their lives and leads them Christ. Just when they think they’re finally on solid ground, the local police declare their father’s death a murder and all clues point to Marva, but she refuses to accept responsibility for her actions. She has a younger sister who needs her. Cicely starts dating the lead detective which rocks Marva’s world once again. Keeping her past in the past becomes a daily battle. She loves her teacher who has become a surrogate mother to her and June but she is terrified of the detective. Coming out of Egypt takes readers through these troubling times and into victory. I highly recommend this story. If You Like Science Fiction, Check out author, Yvonne Anderson! One of my favorite authors….This story is well worth your time reading it…. Great to have you with us today, Readers! India’s Crown has a special treat in store. 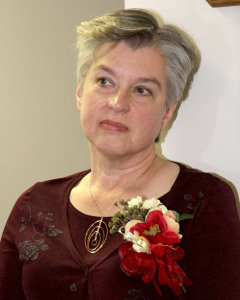 Meet Yvonne Anderson, author of science fiction. Living in Western Maryland, Yvonne Anderson writes fiction that takes you out of this world. She never had any interest in writing until well into middle age, signing her first publishing contract at the age of 55. But here’s the funny thing: she never used to like most Christian fiction, and didn’t read much science fiction of any kind, but now she writes Christian sci fi. This demonstrates that God has a marvelous sense of humor. The Story in the Stars, first book in the Gateway to Gannah series, was an ACFW Carol Award finalist in 2012. A total of four books now round out the series. She does freelance editing, and shares the occasional wise word on her personal site, YsWords. 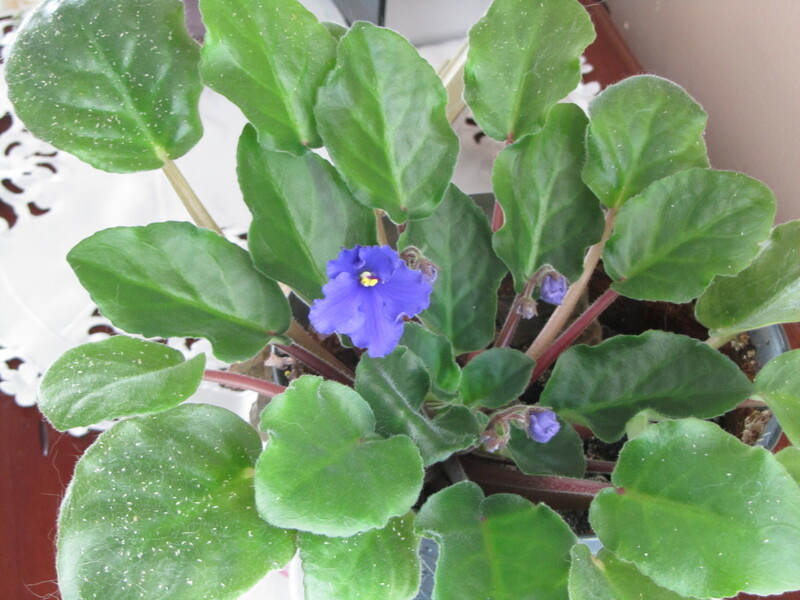 Fifteen years ago my mom gave me a beautiful African Violet. The first time it bloomed its leaves were barely visible beneath the purple blossoms. That Christmas, my grandsons were playing tag and knocked the violet onto the floor. I picked it up, put all its dirt I could salvage back into the pot and added new. But the plant never bloomed again. That is, until one year ago. Right after she died. Again blossoms hid the leaves. In an unidentifiable way, its blooming again comforted me. Many possibilities or explanations came and went through my thoughts, none strong enough to stay. Then, a few days ago, one year after her death, I noticed two new blossoms and an explosion of buds. I still have no explanation, nor do I want one. But with the violet’s renewed zest for life, it causes me to pause, stand apart from my daily busyness and bask in my favorite “Mom” memories.